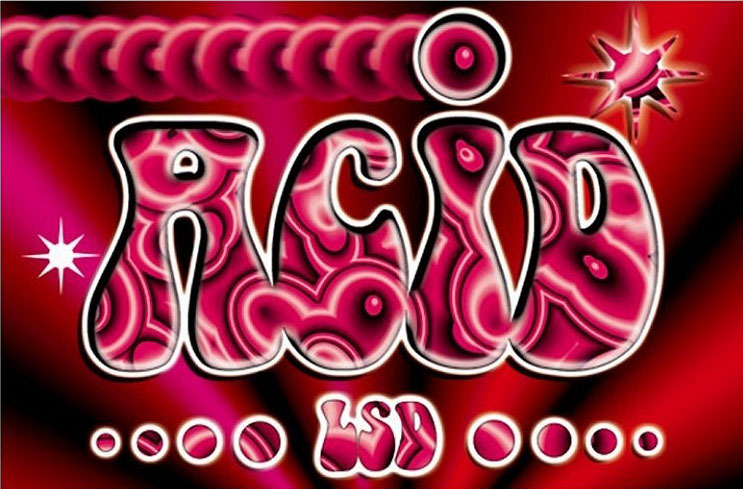 Lysergic Acid Diethylamide (LSD) is a hallucinogenic drug discovered in 1938. It was first ingested by the Swiss chemist, Albert Hofmann, on April 19th, 1943. LSD is most often absorbed into small pieces of paper called “blotter,” but it can also be found in liquid form. It is almost always consumed orally. LSD is extremely powerful. A typical dose is between 100 and 200 micrograms (mcg), which is such a small amount it is essentially invisible. This makes it extremely difficult to measure. A single square of blotter or drop of liquid usually contains a typical dose, but may contain much more. The Plateau – Over the second hour, the effects become more intense. Imaginary visions may begin to appear—from shapes in smoke to lines on the palms of the hand. The Peak – Time is slowed almost to a standstill. Users may feel like they are in a different world, or a movie. For some this is profound and mystical, but it can be very frightening for others. LSD trips can sometimes be frightening, inducing extreme anxiety and panic. Although rare, some people relive the experience days, weeks or even years later in episodes known as “flashbacks.” Flashbacks are not unique to hallucinogenic drugs. They can result from any intense, psychological trauma. LSD may precipitate the onset of schizophrenia in genetically predisposed individuals. In a very small percentage of people, LSD and other hallucinogens have caused a long-lasting disorder known as Hallucinogen Persisting Perception Disorder (HPPD) that affects the person’s visual perception. LSD can impair judgment. Never drive while under the influence of LSD. LSD is illegal and possession can result in long prison terms. Supplying LSD to someone else (whether or not money was exchanged) carries even longer sentences. Be self aware! If you choose to use LSD, knowing why is the best way to maximize the benefits and reduce the risks. Whether it’s for insight, self exploration or simply for fun, your intentions will greatly impact the kind of experience you have. What if somebody is having a difficult trip? As with all psychedelics, ‘set’ and ‘setting’ are important factors in determining whether someone has a positive or negative experience. “Set” is the mental state a person brings to the experience—their thoughts, mood and expectations. “Setting” is the physical and social environment in which the drug is consumed. Being in a good mental state with trusted friends in a supportive environment before taking LSD reduces the risk of having a difficult trip. If someone is having a difficult or challenging psychological experience on LSD, take them to quiet surroundings where they feel comfortable. Find a friend who can reassure them. Clarify to them that their panic is caused by the drug, and will wear off soon. If you are at a festival, find out if Zendo is there. The Zendo Project provides safe spaces with trained staff to assist people having difficult psychedelic experiences. does LSD react badly if you have hyperthyroid and are on tapazole 5mg and propranolol 20mg?